Stable fractures respond well to closed reduction and casting for 6 to 8 weeks. Initial immobilization can be accomplished with a sugar-tong splint. have more than 1cm of shortening. Unstable injuries are more likely to lose reduction and have distal radioulnar or radiocarpal instability and develop subsequent arthritis, producing a weak, stiff, and painful wrist. 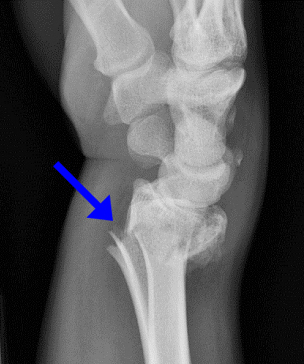 Closed reduction is performed with traction provided by finger traps while the fracture fragment is pushed distal and palmar while the forearm is stabilized. Hematoma block anesthesia is often sufficient. The goal is to restore the volar tilt, radial inclination, and proper length to the radius. This is particularly important in younger patients. The volar tilt ideally should be restored to its normal position, but a minimum of neutral or zero degrees of angulation is acceptable. Although most Colles fractures can be treated with closed reduction and cast immobilization, unstable fractures may require casting with pinning, external fixation with possible bone grafting, or open reduction and internal fixation. All open and neurovascularly compromised fractures require prompt evaluation by an orthopedic surgeon. Most median nerve paresthesias resolve within four days without surgery.